What Is Fluttering in Ear? 1 What Is Fluttering in Ear? Fluttering in Ear are instances when a person can hear fluttering in their ear. This can be nothing but it can be a symptom of an underlying medical condition [1, 2, 3]. Hearing a rhythmic fluttering noise in the ears is a rare form of tinnitus. The term tinnitus refers to the noise that can be heard in the ear or in the head. This is caused by irregular contractions of ear muscles that are attached to the bones of the ear. This occurrence is similar to the twitching of the eyelids that may occur occasionally. Although other forms of tinnitus may lead to hearing loss, muscular tinnitus usually resolves by itself. If the fluttering still persists after a while, there may be a need to consult a physician for a medical intervention [1, 2, 3]. 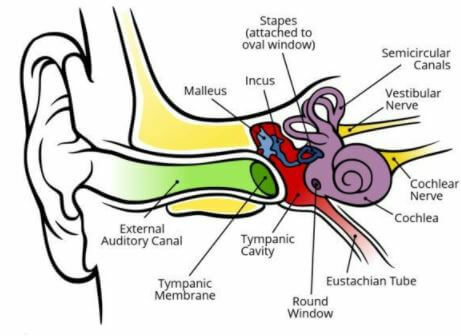 The 2 main muscles that are found inside the ear are the Tensor Tympani and the Stapedius. The Tensor Tympani is located inside the ear and is contained in a bony canal above the auditory tube. Its main role is to dampen sounds like the sound that is being produced from chewing. The tympani Tensor muscle is being innervated by the mandibular branch of Cranial Nerve V or the Trigeminal nerve. The stapedius muscle is just a millimeter in length and is considered to be the smallest skeletal muscle in the entire body. The main function of the Stapedius is to stabilize the stapes which is one of the smallest bone found inside the ear. This muscle is innervated by the tympanic branch of Cranial Nerve VII or the Facial nerve . Figure 1 shows the location of the Tensor Tympani and Stapedius muscle in the ear. The fluttering in ear or muscular tinnitus may occur without any underlying cause but some factors or conditions may add to the frequency of muscular tinnitus [1, 2, 3]. The condition known as myoclonus or muscle spasm is a degenerative disease that may cause an abnormal contraction of the muscles. A spasm of the stapedius muscle or the tensor tympani muscle of the ear is associated with the occurrence of muscular tinnitus . This type of myoclonus is due to a lesion in the triangle of the Guillain-Mollaret in the brainstem. The lesion may be obtained from a trauma, cerebrovascular accident (stroke), multiple sclerosis, and encephalitis. It releases a rhythmic discharge to the muscles in the ear that causes the fluttering sound . The Eustachian tube is the canal that connects the back of the throat to the middle ear. It is normally closed but some individuals have a patent or open Eustachian tube. Those who have this may experience fluttering in their ears when they are chewing, swallowing, and talking [3, 4]. Some medications such as Non-steroidal anti-inflammatory drugs (NSAID’s), antibiotics and chemotherapy have tinnitus as a side effect. The occurrence increases as the dosage of the drug being taken increases as well . The occurrence of ear fluttering is also associated with a lack of sleep, high levels of stress and increased caffeine intake . As mentioned earlier, most types of ear fluttering usually resolve by itself. But for the persistent types, there are measures to decrease the frequency of muscular tinnitus [1, 2, 3, 4]. Ear fluttering related to stress can be reduced by performing relaxing activities such as listening to music or reading. Niacin has been used in the treatment of fluttering in the ear and it has shown some degree of success in treating the condition. It promotes relaxation of the muscles in the ear and increases the blood flow to this area. Those that are caused by muscle spasms can be treated with a physician’s prescription of low-doses of anti-seizure medications. Knowing the side effects of the medication you are going to take may give awareness to what to watch out for after taking the medication. Although some fluttering in the ear may be normal, a persistence of this symptom should warrant a consultation with the physician. Limit the intake of over-the-counter medications such as ibuprofen or aspirin that can increase the frequency of ear fluttering. Injection of botulinum toxin to the ear muscles in the tinnitus caused by palatal myoclonus has shown some success in minimizing the fluttering. If the muscular tinnitus proves to be disrupting to the patient, a minor surgical procedure that involves cutting the muscles in the ear to stop the abnormal contractions.